Serums are confusing. Are they highly concentrated and super-ingredient packed powerhouses of youth giving face juice? Or just super expensive clear slime? It’s hard to believe that they are the most important part of your daily routine because they look so incredibly innocuous and often come in tiny glass vials. Having never previously felt the need for more than a mid-market moisturiser, as I head towards my mid-forties, I find myself wondering whether my fine lines need a little more help. So I’ve turned my attention towards the confusing world of the serum. 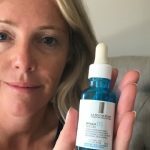 Whether you want to deal with fine lines, pigmentation or sagging, the most important thing is to realise that if applied incorrectly, serums don’t work. A horrifying thought indeed. Their highly concentrated and active ingredients may be the reason why serums are frequently more expensive than moisturisers, but you may as well set fire to your tenners if you don’t apply it correctly. 1. Think of face cream application as being like posh cutlery – working from the outside in. The thinner the product, the earlier the application. Apply a serum first, then moisturiser and make-up. 2. Less is more. A few drops of serum is all you need. 3. Apply to a clean face, and use tepid water so pores are ready to absorb the goodness. 4. Wait a couple of minutes (or as advised) before applying moisturiser and normal make-up. For dehydrated skin which shows signs of ageing – hyaluronic acid plumps up and B5 repairs skin and encourages collagen turnover. An oil free gel moisturiser with optimum hydration and a little goes a very long way. Formulated with 0.06% stabilised retinal, a powerful derivative of vitamin A this overnight serum visibly minimises fine lines and wrinkles. Recommended by beauty experts (including us). Oh so pricey but absolutely incredible results. Epidermal Growth Factor (from Icelandic barley. Obviously) really does reduce the appearance of fine lines. Sell the car. Try it. One of those with a waiting list of ten million (or something). Anyway, jolly inexpensive with an intense amount of peptides and seriously super ‘it works’ science.